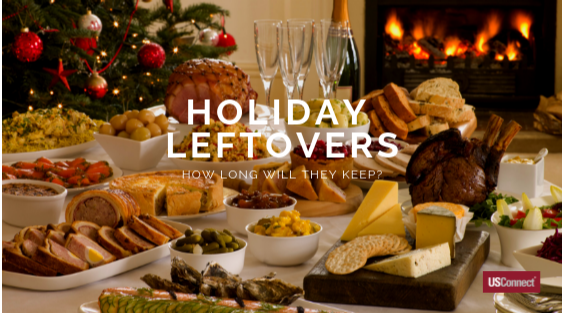 Holiday Food Leftovers – How Long Will They Keep? Over the holidays, you are likely to be preparing a large meal for family and friends. But what to do with all the leftovers? In a short time, you and your family members will be sick of eating turkey or ham sandwiches, hash, or other leftover-inspired dishes. Knowing prior to a holiday how long you can store certain cooked foods will help you avoid having to throw out food as well as ensuring that it is safe to eat. 1. How long food is left to sit out at room temperature after a meal. Family and friends often sit around the table talking after a holiday meal and may lose track of time. Turkey, stuffing, gravy, and other side dishes should be refrigerated within two hours of the time it was cooked—not from the time it was served. Turkey should be cooked until it reaches 165°F as measured by a food thermometer. The temperature should be checked in the thickest part of the breast, the deepest part of the thigh, and the innermost part of the wing. Fresh or smoked ham should be cooked to a temperature of 145°F and allowed to rest for three minutes. Reheat fully cooked ham to 140°F. Beef, pork, veal, and lamb should be cooked to 140°F and allowed to rest three minutes. You can store leftovers for 3-4 days in the refrigerator. If you have a larger quantity of food than you can eat within that time, freeze part of it within two hours of the time it was cooked. If turkey was cooked with stuffing inside, remove the stuffing and store it separately from the leftover turkey meat. You do not have to let hot food cool off before putting it into the refrigerator but divide it into smaller portions to allow it to cool off more quickly in the refrigerator. From a registered dietitian, the following guide is helpful. Halloween Candy: Eat This, Not That! If you’re like most parents, you can’t resist raiding your child’s trick-or-treat bag on Halloween night. Or maybe you’re not a parent but can’t fight the urge to eat those Fun-size candy bars you are giving out on Halloween. Either way, all that Halloween candy can be really tempting. You can indulge and not completely derail your healthy eating habits by choosing your treats wisely and keeping portions to a minimum. In other words, don’t eat a whole bag of Fun-size Twix bars in one sitting! 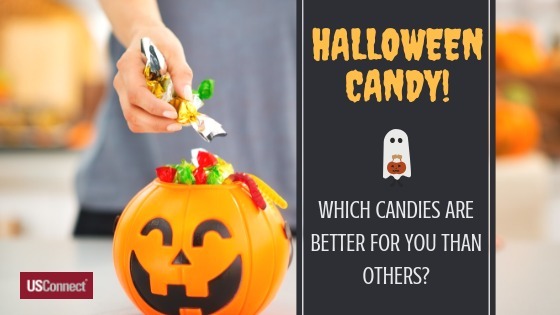 Leave most of the candy to the little ghosts and goblins after you satisfy your sweet tooth with one of these small treats. While both candy bars are high in sugar and calories, that snack-size Kit Kat has 3 grams of fat and 7 grams of sugar compared to a Reese’s peanut butter cup that clocks in at 10.5 grams of fat and 6.5 grams of sugar. And who can eat just one? Dark chocolate contains antioxidants and has less sugar than regular milk chocolate candy bars. Keep portions small though and stick with fun-size options. If hard candy is your weakness, you’re better off choosing Sweet Tarts rather than Skittles candies. Sweet Tarts have 2.4 grams of sugar per min-bag while Skittles have a whopping 14.5 grams of sugar per mini-bag. Smarties have only 5 grams of sugar and no fat, while most fun-size chocolate bars contain 7 grams of sugar or more, and 3 grams or more of fat per bar. Jelly Bellies have only 35 calories per serving and no fat, but M&Ms (all varieties) are loaded with both fat and sugar. 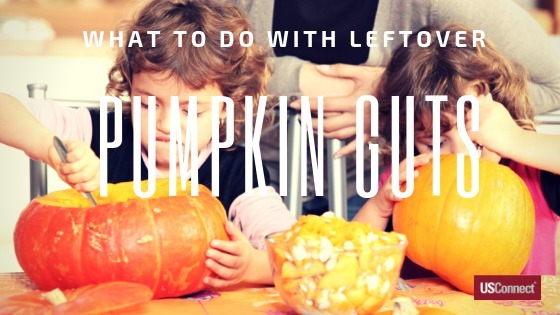 What to Do With Leftover Pumpkin Guts? It’s almost Halloween and chances are, you’re getting ready to carve a Jack O’lantern. If you’re planning on some pumpkin carving fun with your family, don’t just throw out those pumpkin insides. There are lots of easy recipes you can make that put those pumpkin parts to good use. Plus, pumpkins are one of the most nutritious fruits around—they’re packed with antioxidants, fiber, potassium, and Vitamin C. And don’t forget about the seeds! Pumpkin seeds contain antioxidants, magnesium, zinc, and fatty acids and make a great fall snack. Roasting pumpkin seeds is really easy and can be fun for kids too. You can eat them alone as a snack or mix them with other nuts and dried fruit for a healthy, seasonal trail mix. Just put them on a nonstick pan (in one layer), and sprinkle a little salt or other seasonings for taste, and then roast them in the oven at 300 degrees for 45 minutes. Pumpkin soup makes a great seasonal meal as the weather gets colder. Use those leftover pumpkin insides to make this creamy pumpkin soup recipe. Separate the seeds from the pumpkin flesh, and use the flesh to make a puree for pumpkin bread or muffins. Follow this recipe to make delicious pumpkin bread or divide into a muffin pan to make pumpkin muffins. As you are cleaning out your pumpkin to carve, place the stringy bits and seeds into a large bowl, and soak in hot water to help soften. Mash up these pieces, and then strain so you are left with a bright orange juice. Use the pumpkin juice in smoothies or sauces. This week marks the beginning of Ramadan, the holiest Muslim month. During the ninth month in the Muslim lunar calendar, observant Muslims all over the world commemorate the revelation of the Quran to Muhammed by both feasting as fasting. 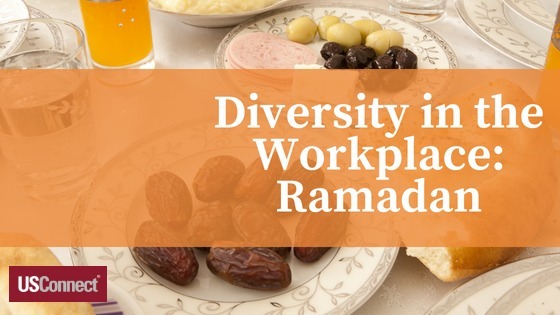 Islam is the world’s second-largest religion; what do HR departments and employees need to know about this important holiday? Even during the rest of the year, observant Muslims eat only foods that are halal. Like kosher foods, halal (lawful) rules of Islam prohibit pork, as well as “carnivorous animals, birds of prey, animals without external ears (some birds and reptiles), blood, alcohol, and foods contaminated with any of these.” According to Today’s Dietician, processed food containing ingredients like gelatin, emulsifiers, and enzymes may be unlawful for some Muslim consumers, so providing nutrition information is especially important. The timing changes every year. Ramadan goes by a lunar calendar instead of the Gregorian calendar that is most widely used in secular society. The holiday starts the day after the new moon of the ninth month, and ends with the new moon of the tenth month. In 2018, Ramadan starts on May 15. In 2019, it will start on May 5. To be culturally sensitive to this changing holiday, it’s a good idea to keep track of when it will fall each year. Observant Muslims fast during the day during the whole month of Ramadan. Before dawn, Muslims eat a meal called suhoor, and they break their fast after dusk with a meal called iftar. Be aware, if any colleagues or employees are observing Ramadan, that it would be insensitive to offer them lunch or snacks during the day. Kolak: A fruit dessert made with palm sugar, coconut milk, and pandanus leaf. Fruits, such as jackfruit or banana, or mung beans are added (Indonesia). In our increasingly globalized world, it’s more important than ever to be respectful of all traditions, and USConnect is glad to help. 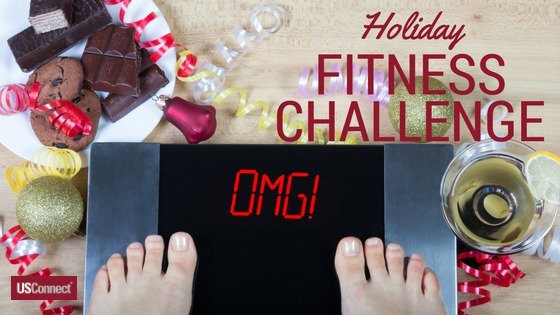 Are You Ready for a Holiday Fitness Challenge? Commit to a short daily fitness routine to help you stay healthier this holiday season. Between Thanksgiving and New Year’s Eve, an endless succession of family dinners, office parties, and edible gifts can derail even the healthiest eaters. Combined with the colder weather, ‘tis the season to pack on the pounds like a Christmas goose. To counteract the seasonal splurges, why not try an office exercise challenge? For yourself or for a group of colleagues, these workplace exercises can be a fun way to keep fit. Once an hour, run up and down a flight of stairs at least once. Advanced/ambitious team members can do several flights each hour. Every two hours, stand up and place hands on desk, about shoulder-distance apart. With your arms straight, walk your feet backwards until your body is at a 45-degree angle to the floor. Keeping your body straight, do 10 pushups. For core strength, you have to hit the floor, so you may want to bring a towel. First, lie face-down on the floor, with your arms above your head, pointing straight in front of you. Then lift your arms and legs a few inches off the floor; you’re Superman! Hold for 30 seconds, then rest. Flip onto your back, with your arms extended over your head. Carefully, making sure your lower back doesn’t arch; lift your arms and legs so that your body forms a wide V. You’re a banana! Hold for 30 seconds, then rest. Do three times during the day, and try to lengthen the time you hold each pose. This one works best if you’re doing a fitness challenge with a group. Once an hour, write a note—an encouraging quote, or a joke, or a bit of good-natured gossip—to a colleague. Walk to that person’s office in the most roundabout way possible. Standing around waiting for the coffee to brew? Sit instead… against the wall. Wall sits work your legs and core, and they’re harder than they look. Stand straight, with your back against the wall. Slowly slide your back down the wall, bending your knees until they are at a 90-degree angle. Now hold it for as long as you can. For fun, get other colleagues to join you, and see who can hold it the longest. Get someone to take a picture; there’s your company photo! The company that stays fit together stays together! 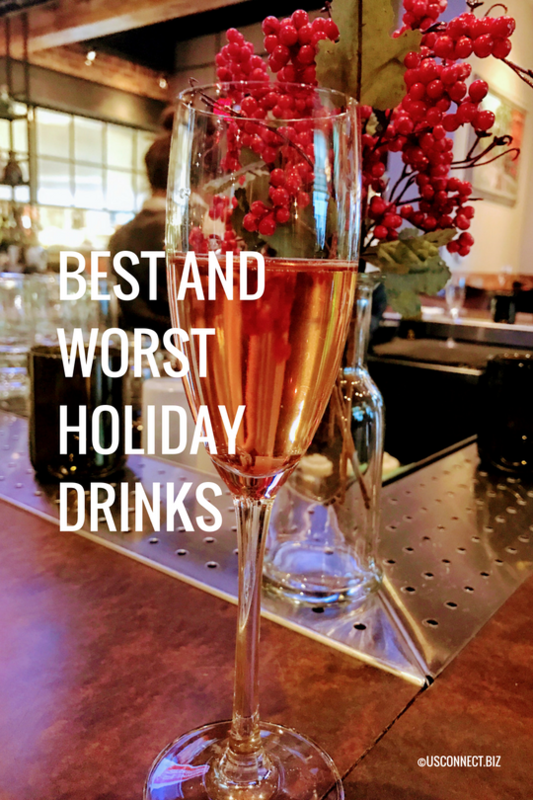 What Are the Best and Worst Holiday Drinks? The holidays are here, and with them the usual raft of parties and get-togethers, along with a slew of holiday-themed hot and cold drinks. From your morning coffee to your evening cocktail, here’s how the most common holiday drinks stack up. The Worst: When you want to really indulge, try Caribou Coffee’s Campfire Mocha, with a whopping 640 calories, 34 grams of fat, 21 grams of saturated fat, and 67grams of sugar (about 17 teaspoons). That exceeds the recommended daily allowance (RDA) for both fat and sugar in just one morning drink! Better: Craving that sweet combination of milk, sugar, coffee, and seasonal flavors? Try Starbucks’ Gingerbread Latte with Nonfat Milk (Grande). By downgrading from 2% milk to skim, this treat clocks in at 270 calories, seven grams of fat, 4.5 grams of saturated fat, and 37 grams of sugar. And that even includes whipped cream! Best: Save some money and be healthier by making your own fancy coffee drinks. Start with delicious Route 66 coffees and add flavored syrups and skim milk; your wallet and waistline will both thank you! The Worst: Nothing says “Christmas Party” quite like eggnog. And no cocktail is as laden with fat as this scrumptious dessert-like drink, which is made with egg, sugar, and cream. Combine all ingredients, except the seltzer, in a blender and process until foamy and aerated (you can always froth by hand in cocktail shaker with vigorous shaking). Add crushed ice and swirl to chill. Strain into a large wine goblet and top with seltzer. Garnish with a grating of nutmeg. Best: Try a holidaytini, a martini-style drink that combines vodka, cranberry juice, grenadine, orange juice, and lemon or lime juice. Or to take off the chill, add a splash of rum to your hot brewed tea with lemon to enjoy a hot toddy. Holiday office gifts—whether a novelty mug of candy for a cubicle-mate or a lavish corporate gift basket—tend to rely heavily on unhealthy holiday treats. Chocolate kisses, homemade baked goods, smoked sausage: these delicious gifts can derail even the most determined healthy eater. While most people enjoy a gourmet goodie once in a while, the holiday season tends to see an excess of unhealthy food. 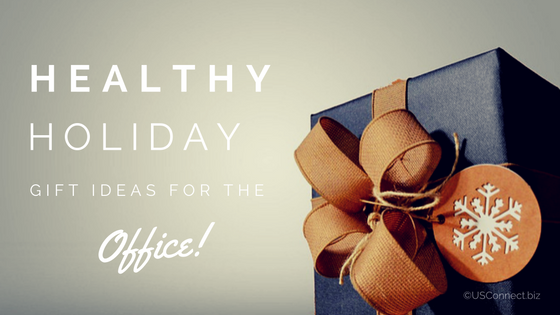 When giving office gifts this year, why not help colleagues stay healthy with these gift ideas? DIY Healthy Treats: Why fill that “I Hate Mondays” coffee mug with chocolate candies when you can create your own healthy trail mix? Mix nuts, legumes, seeds, dried fruit, and even a few treats like chocolate chips to create a high-energy, low- sugar snack. By the third day after Thanksgiving, everyone is sick of turkey sandwiches. With more holidays in front of us, we need some fresh ideas on what to do with our leftover holiday food. We’ve scoured the latest recipes to bring you this roundup of the most delicious things to do with that turkey and fixings. Lighten Up: A twist on traditional tacos, this healthy recipe for turkey tacos uses iceberg lettuce leaves instead of tortillas as a wrap for turkey, sweet potatoes, cranberry sauce, and a savory black bean salsa. Finish with red onion and cilantro for brightness, and you’ve got the perfect recipe to eat turkey without the food coma. Take Stock: Do not throw out that turkey carcass! Throw it into a pot with some carrots, celery, and onion. Pour water and/or chicken broth over the bones and vegetables and let simmer for at least four hours (eight is preferable). Strain the bones from the top, and you’ve got a rich, healthy stock that you can use for soups and sauces or freeze for future use. Greek System: You know that turkey stock you just made? Use it to make this delicious Avgolemono: a creamy Greek soup with turkey, lemon, and rice. It’s light, too; the creaminess comes from eggs, not cream. It’s easy to make, and much more elegant than regular turkey noodle soup. Spice It Up: You can use that same rich turkey stock to make another light and flavorful soup: Turkey Caldo Tlalpeño, named for the area near Mexico City. This recipe includes healthy chickpeas and uses chipotle chiles in adobo sauce to get its unique flavor. Stellar Stuffing: We’ve given you four healthy recipes; now here’s a decadent one. Turn your leftover stuffing into fried stuffing bites, and use your leftover cranberry sauce as a dip. Stuffing is formed into cubes, dredged in egg and breadcrumbs, and fried on the stove: not healthy, but delicious!